Dedicated service to Danville, Virginia. Sacred Heart Catholic School has a long, rich tradition of service to the City of Danville and surrounding North Carolina and Virginia communities. Sacred Heart School, 344 West Main Street, 1953. Sacred Heart School, 708 Randolph Street, 1966. Sacred Heart Catholic School, 2016. Founded in 1953 as Sacred Heart School (SHS), the school immediately began building a strong reputation as a provider of high-quality primary (grades 1-8) education in Danville, Virginia. Four Sisters of Mercy from Merion, Pennsylvania, opened the school doors on September 9 with 67 students in a Victorian house at 344 West Main Street. While Sacred Heart has grown, the school remains the city’s first and only Catholic school and its oldest non-public school. In decades that followed, the Sacred Heart School grew in students and prospered within the community. 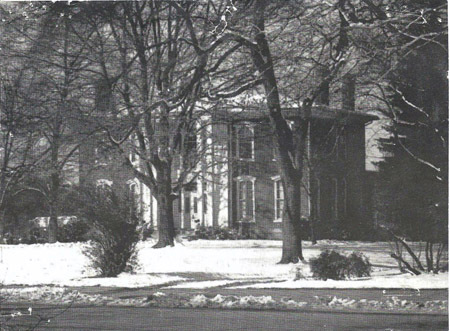 In 1966, Sacred Heart School moved to its current 540 Central Boulevard location. The site featured a newly constructed building and room to grow. The extra room was critical since SHS would begin an ongoing effort to modernize and improve the academic environment of the Sacred Heart student. Since the move, the school facility has grown to accommodate a growing student interest with several additions and upgrades. In 1996, an additional wing was constructed. It was attached to the main building through a breezeway. The new wing included the Holy Family Gym, four classrooms, and additional bathrooms. In 1999, SHS added a middle school wing that housed two offices, five classrooms, two computer labs, and an after school care room. The addition of the new middle school space greatly enhanced the school’s upper grades and began a process that introduced computer-based learning and technology into the academic curriculum. In 2001, the school church was dedicated. The church was attached to the main structure and provided a central area for worship. Its presence provided a tangible reminder of a key focus at the school, a Christian education. In 2002, a new playground was constructed. A safer, up-to-date play area provided an exciting new recreational space for all students. The main building underwent renovations in 2003 in order to update kindergarten and first-grade classrooms. The bathrooms on the main hall, the office, and teacher’s lounge were also updated. In 2007, SHS launched a Blue Ribbon Capital Campaign. The campaign allowed the school to update the music program through the purchase of guitars and iPads and remodel both the kitchen and the library. In 2012, the school underwent technological updates which provided state of the art educational technology. This effort included new three computer labs, PolyVision, Smartboards, and iPads. In 2017, the school approved its name change to the Sacred Heart Catholic School (SHCS) to better reflect the nature of the school and its proud tradition of excellence in Christian education. A new facade was constructed to provide shelter for students entering and exiting the school.